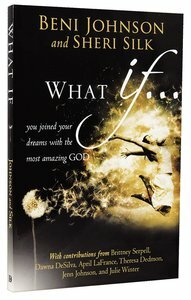 Trusting God to fulfill all your “What ifs” and beyond. needed healing and received it? believed in yourself and partnered with your amazing God? could learn to live out of your passion? And what if you lived in the Kingdom of God, which means you live in righteousness, peace, and joy—it’s true! You can be enjoying a life of joy in the Lord, peace in the Holy Spirit, and the righteousness of Jesus Christ, your personal Savior. but righteousness and peace and joy in the Holy Spirit (Romans 14:17). Today you can join your “What ifs” with God’s love and anointing—and you will be amazed at what the two of you can do together!